Balance business objectives with travel and collaboration options that raise productivity and satisfaction. Achieving this ideal is possible if your people have attractive options and a clear understanding of the consequences of their choices. Advito can help you to shape and execute a practical, cost-effective and enjoyable Traveler Engagement program that reflects the best interests of your people and company. We equip travel managers to clarify expectations and objectives, compliance and economics, and provide the resources necessary to produce compliant, balanced travel programs. Real-time data supports the ability to provide timely and appropriate options as they arise, and to monitor program performance continuously. The goal of the Advito Traveler Engagement program is multifold. The holistic approach spans collaboration, policy and marketing. 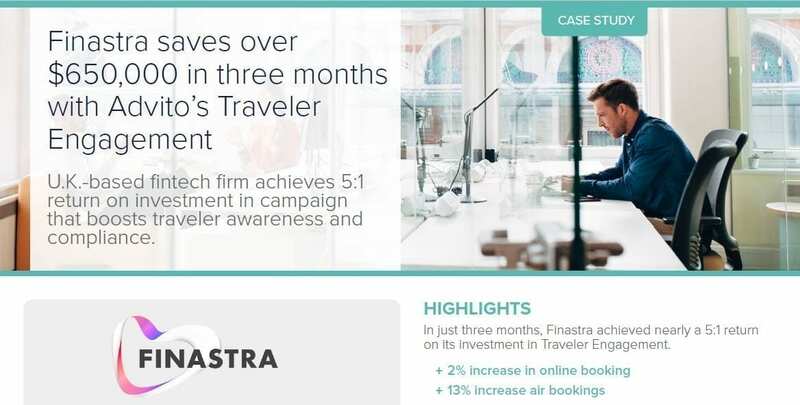 With it, we help you create corporate travel programs that inform, motivate and satisfy travelers and company leadership so you can sustain a culture of wise travel demand and traveler behavior. With innovative merchandising strategies we can leverage technology and deliver content at just the right time to influence the best purchase decisions. In any organization, some internal travel is necessary, and even small reductions can produce measurable savings without negatively impacting your organizational culture. Advito helps balance face to face interactions with modern virtual encounters to realize measurable benefits. Advito develops travel policy that generates and sustains trust and opportunity. When it’s fair and communicated clearly, policy is a proven way to reduce travel costs. Achieve better program performance and improved experiences with targeted messaging that informs and engages your travelers at every step. It’s time to engage and influence your travelers to make more productive decisions that lead to greater savings. Learn how you can change behavior and see measurable results.